That printer is sticking out its tongue; mocking me. (sung to the tune of the Pillow Pet jingle). Great, now I get to wonder WTF a Pillow Pet is. We have that exact model at work – it’s both. And a fax and scanner, too. I have a pillow pet. It’s an alligator. It is the best napping pillow ever. If it’s like the ones I’ve worked with, it is a fabulous copier and can also be hooked up to a computer. I got tone, but I got no toner. 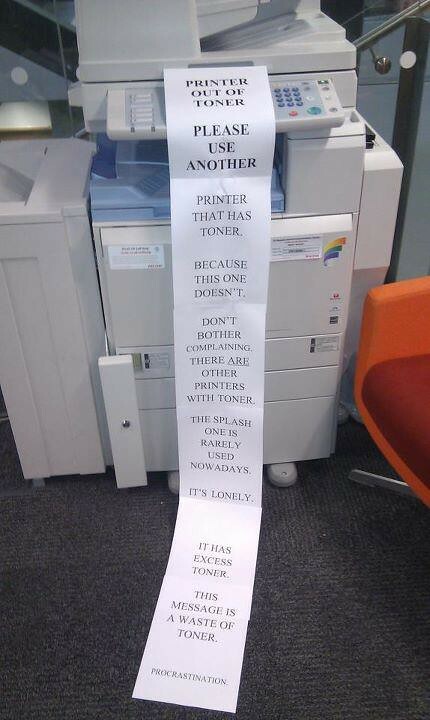 Don’t use that toner voice with me! I must know what the “splash” printer is? If it splashes toner around, I can guess why it is rarely used. SPLASH stands for “Student Personal Learning and Study Hub” at our university. A million times less exciting than it sounds. That would explain why it has toner–because the undergraduates never use it. I want to find the person who made these and give them a high five. That is one entertaining series of notes. I wonder why it’s out of toner. I don’t understand why they didn’t just refill the toner cartridge, rather than using their time to create rather amusing jokes. Well… if you understood, you’d understand. From what I understand about toner and printers, there’s usually only ONE person EVAR in the whole building/campus/complex who A) knows where the toner is and B) knows how to change the toner without breaking the machine. That IS if the toner shipment even came in. Not going to lie. I’ve probably been shown how to change the toner about 10 times. But I wasn’t really paying attention any of those times. As anyone who has a home printer knows, laser toner is expensive. So that’s why there’s only one person who knows where the toner treasure chest is located. And this elusive individual was taught by the Xerox / Cannon / HP whisperer how to change the toner. Because 1) the toner is locked up, if it is even stocked. 2) the person with the key DOES NOT ALLOW “just anyone” to change the toner because of the mess a few have created. 3) the person with the key isn’t in today or is out to lunch. I am the ONLY person allowed to change toner in our office. I have this prestigious honor because when there’s not a designated person, we run out. Someone will put in the last toner and not mention it or bother to reorder. No one notices until that one is empty and we have to wait for an overnight shipment to arrive from HP. After paying a couple hundred bucks at The UPS Store, management put the iron foot down. It’s a heavy burden I bear, but I know it’s for the greater good. Some revere me, others loathe me, but at the end of the day, they can all thank me as they gaze upon the walls of fantasy football flyers and color photos of their pets and families they were able to produce because of my diligence. I’d also like to point out that there is another identical printer two steps to the left of this one. The printers round here come in pairs – stops ‘em getting lonely like the poor old SPLASH one. Oh, you’re duplicating your effort! That’s tuition money well spent. Our toner supplier won’t let us have backup toner cartridges on hand, because the tsunami that hit Japan is still having an effect on the toner market.